Celtic Myth & Magick: Harness the Power of the Gods and Goddesses (Llewellyn's World Religion and Magic Series) est le grand livre que vous voulez. Ce beau livre est créé par Edain McCoy. En fait, le livre a 464 pages. The Celtic Myth & Magick: Harness the Power of the Gods and Goddesses (Llewellyn's World Religion and Magic Series) est libéré par la fabrication de Llewellyn Publications. 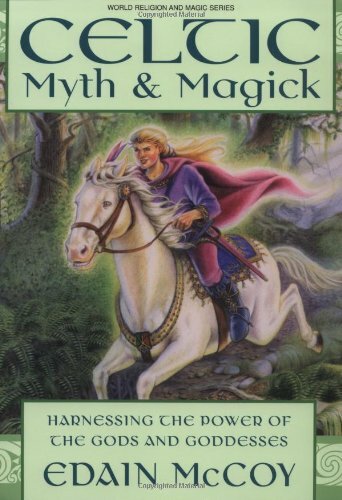 Vous pouvez consulter en ligne avec Celtic Myth & Magick: Harness the Power of the Gods and Goddesses (Llewellyn's World Religion and Magic Series) étape facile. Toutefois, si vous désirez garder pour ordinateur portable, vous pouvez Celtic Myth & Magick: Harness the Power of the Gods and Goddesses (Llewellyn's World Religion and Magic Series) sauver maintenant. Tap into the mythic power of the Celtic goddesses, gods, heroes, and heroines to aid your spiritual quests and magickal goals. Human and divine energies complement each other; when joined, they become a potent catalyst for true magick and change. Celtic Myth & Magick describes the energies of over 300 cross-referenced Celtic deities and heroic figures so you can quickly determine which one can best help you in attaining specific goals through magick―such as greater prosperity (Cernunnos), glowing health (Airmid), or a soul partner (Aengus MacOg). This guidebook explains how to use creative Pagan ritual and pathworking to align yourself with the energy of these powerful archetypes. Undertake three magickal quests to the inner plane―where you'll join forces with Cuchulain, Queen Maeve, and Merlin the Magician to bring their energies directly into your life. This inspiring, well-researched book is written especially for solitary Pagans who seek to expand the boundaries of their practice to form working partnerships with the divine.